I am always looking for unique scissors to carry. All the Dovo scissors are directly from Germany. The prices will be varied due to the exchange rate. 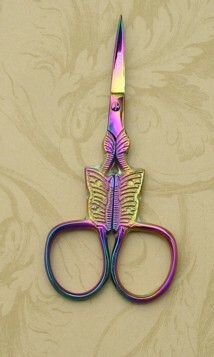 All the scissors have very fine detailed on the handles. Not all the Dovo scissors come with the leather sheath. 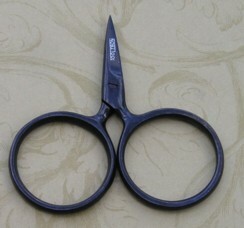 All the Dovo Scissors with sharp tips I sell on the web site have leather sheath to protect the sharp points. 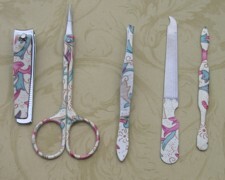 If you want to order Dovo scissors that I don't carry on my web site, please feel free to email me. 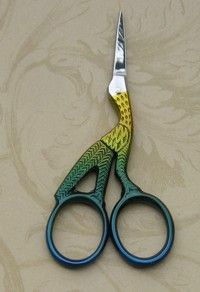 Please be sure to check out Anita's scissors collection for exceptional scissors. Copper color. 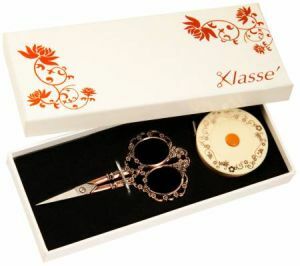 4-1/2in blossom scissors and 60in retractable fiberglass tape measure with magnetic back. Packaged in premium silver foil gift box. 4-1/2in blossom scissors and 60in retractable fiberglass tape measure with magnetic back. Packaged in premium silver foil gift box. Special edition, limited quantity at a special price. 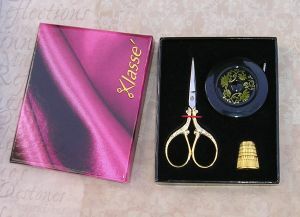 3 1/2 scissors, thimble and measuring tape in a gift box. This old time vintage scissor case has a hand painted design and includes a ring for attaching to a necklace or chatelaine.